So I've decided that I want to have another robot that can be brought to the UK events by plane, and so, in between working on Barróg, I'm gonna try a Beetleweight design, as they seem to be picking up steam in the past few years, and ants are a little too finicky for me. The robot is called Léim, pronounced like the word "lame", and I decided on this name for two reasons. One, léim is the Irish word for "jump", which I think fits a flipper, and two, I can introduce the design by saying "I'm Eoin, and my robot is lame". 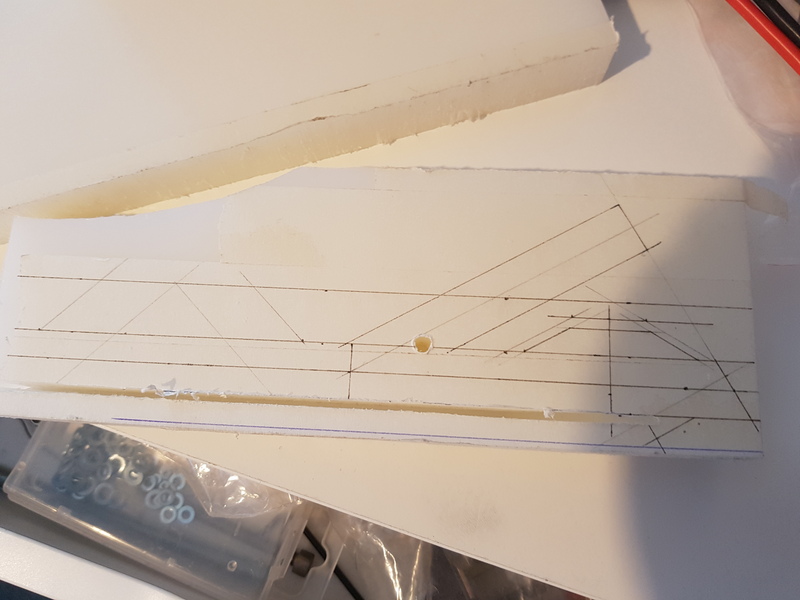 Far from going with a simple design for a first build, I've decided to make a spring powered flipper, which might be a first for UK BW's, I'm not sure. From what I've gathered, BW flippers are either motor powered fast lifters, or teeny tiny pneumatics flippers. Hopefully, a spring can give me more of a hop than motors, and more flips than pneumatics. The spring is wound back by a high torque servo using a choo-choo mechanism which allows a pull back and release function from a single rotation. At full tension, the springs exert 4kg of force, so that should be enough to hopefully get a little airtime from opponents. 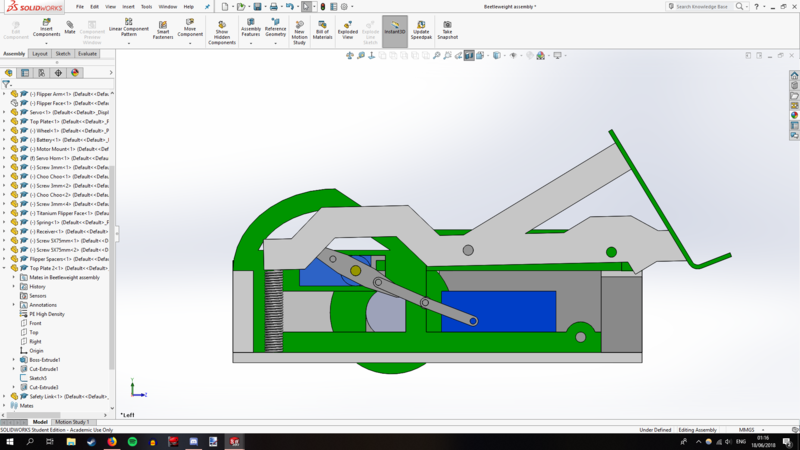 As for other parts, I'm using 5mm, 10mm and 20mm HDPE for the chassis and weapon, and a 80 X 100 X 1.8mm piece of titanium for the front scoop, which should stand up to most threats. Two 2S 65C 550mAh batteries wired in series will provide power over a 4S battery for more even spacing of weight and being lighter in general. 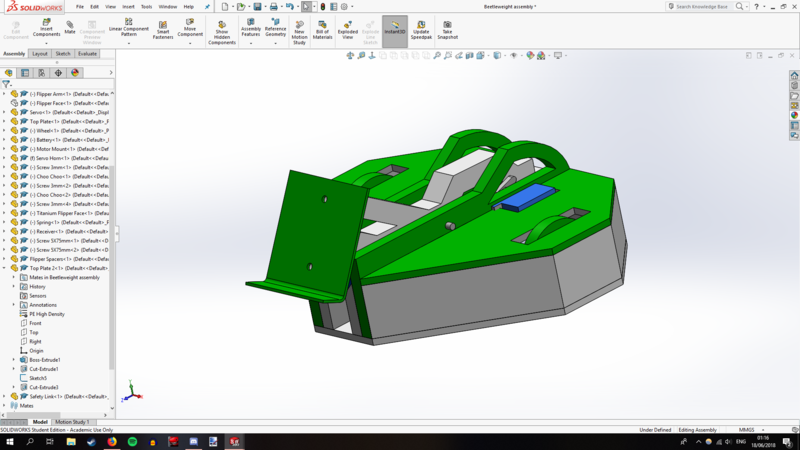 Vex 29's will be used for ESC's (not included in CAD) and modified to take the amps needed. Finally, 12V 500rpm Pololu motors will be used for the drive; I know 1000rpm are standard, but I found myself overshooting a lot with my feather, and will go for more power in drive as opposed to speed. Besides, in my eyes a slow well controlled robot should beat a quick poorly driven bot any day. 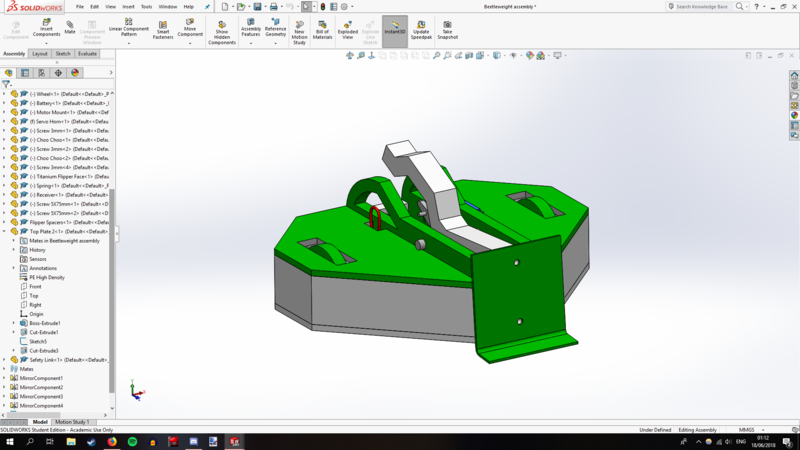 At the moment, the bot is predicted to weigh 1.2kg without bolts and wiring, so hopefully no last minute hole drilling will be involved this time round. I'm hoping to have the bot done before summers end, and get to at least one BW event in 2018, either a Beetle Brawl or the Euro Champs. A view of the bot with the weapon both loaded and fired. A rough guide of where I'm planning to put all of the internals. A more detailed look at the choo-choo mechanism. Last edited by Shooty; 18th June 2018 at 21:44. Looks neat, don't think I've seen a spring loaded flipper in the BW category before. No guarantee yet as to how effective the springs will actually be. First priority is to get a test setup for the flipper working. This looks really great - nice distinctive shape to it. I've always liked the idea of spring powered flippers, and felt that they're very underused. If I were to nit-pick on the design itself, perhaps make the sides of the front scoop flush with the side panels? In other words, keep the pointed design, but slightly change the angle/length of the sides so that the front face is the same width as the scoop? If that makes sense? I can imagine a horizontal spinner catching the sides/edges of the scoop and tearing it up. Of course this depends on your weight allowance. Other than that though I really like it! Also thank you so much for posting the name of this mechanism you are using! For so long I've wanted to know how a spring powered weapon could work. Am now watching videos and reading posts about this - it's super satisfying to finally understand it, even if it does have a goofy name! Kinda surprised I didn't find this sooner. Last edited by dotDominic; 19th June 2018 at 09:44. Extending the sides to fit the scoop could be done, though weight is always a factor. The arm is the way it is to actually have enough length so that it can be pulled back, essentially the entire bot was designed around it. At the moment, all the angles make a perfect octagon, the sides could be brought out, though it would need two extra wall pieces to go next to the bracket. Might have a solution to that, though I'll announce that later. 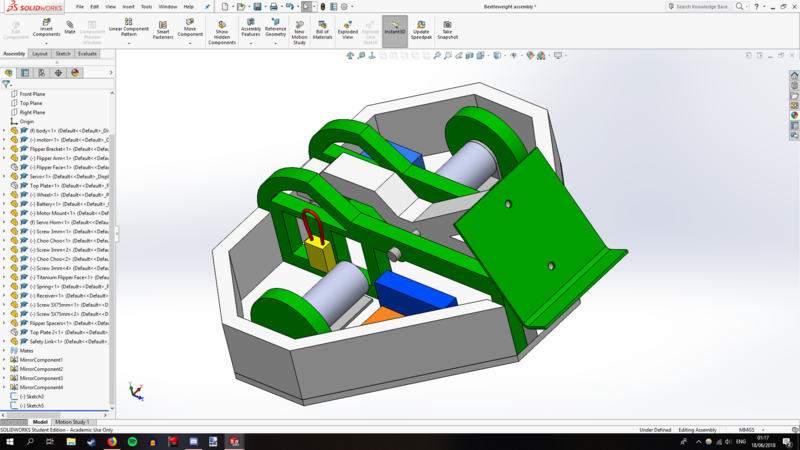 I had wanted to build a spring flipper for a while now, but it was Tantrum from Battlebots that gave me the missing key. I saw their announcement post, saw the words "choo choo spring flipper", did some digging, and so the beetle was conceived. Sometimes it's really that simple! Parts have started to come in for the beetle, all but the servo, motors, and the HDPE. Nothing construction-wise to report on but rather this post is mostly a warning for something I've discovered about the batteries I've bought. The 4S 550mAh batteries I've bought are great specs wise, but they do have one fatal flaw: there is no main power output, and the balance leads seem to follow a different standard then the average. 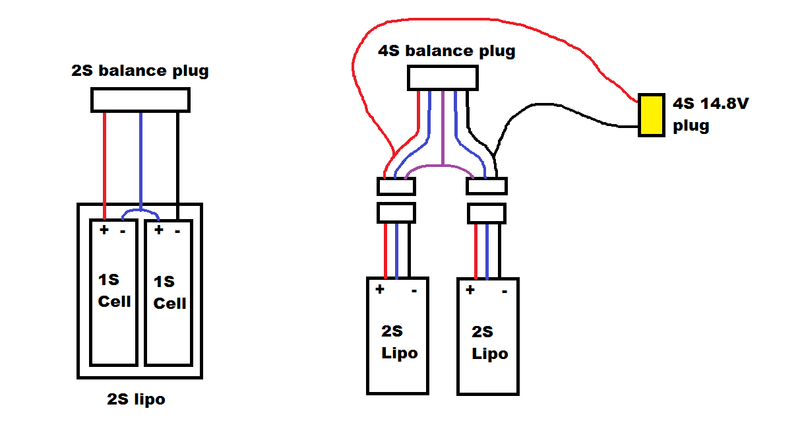 These batteries use a connector type called JST-XHR, while the normal standard for balance leads is JST-XH, and the two are NOT compatible with each other, differences seen in pics shown below. 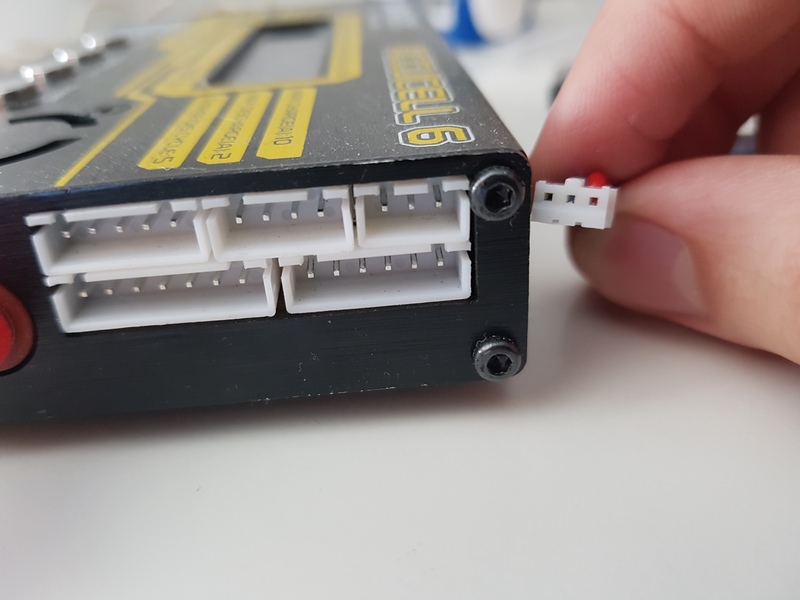 To solve this, I've ordered two JST-XH male connectors off ebay, and will replace them with what is on at the moment. 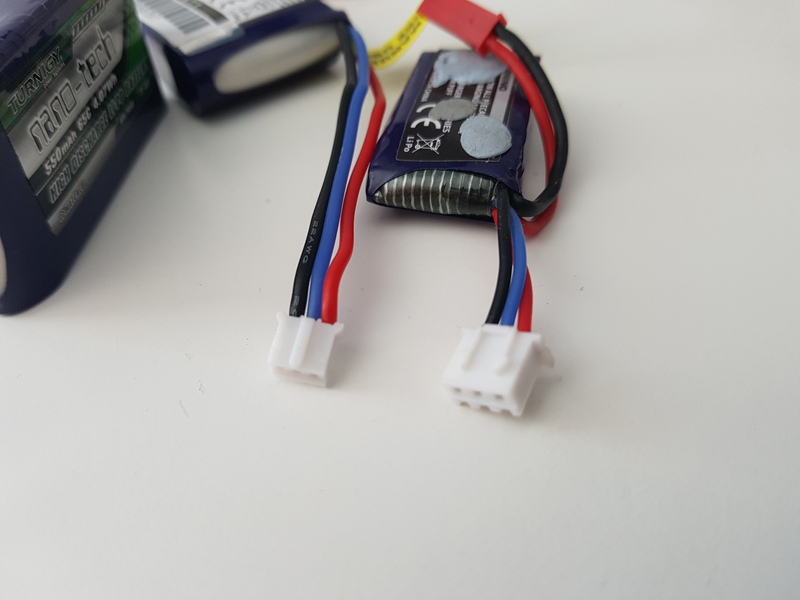 I've also ordered an adapter online that you can plug two 2S 3-pin balance leads in one end and have a 4S 5-pin balance output as well as a main power output on the other end. Special thanks as well to roboteer Tashic for his handy battery wiring guide for getting the same result without having to buy an adapter. Alright so quick question regarding servos. I've modified the servo I'm using to turn 360 degrees. 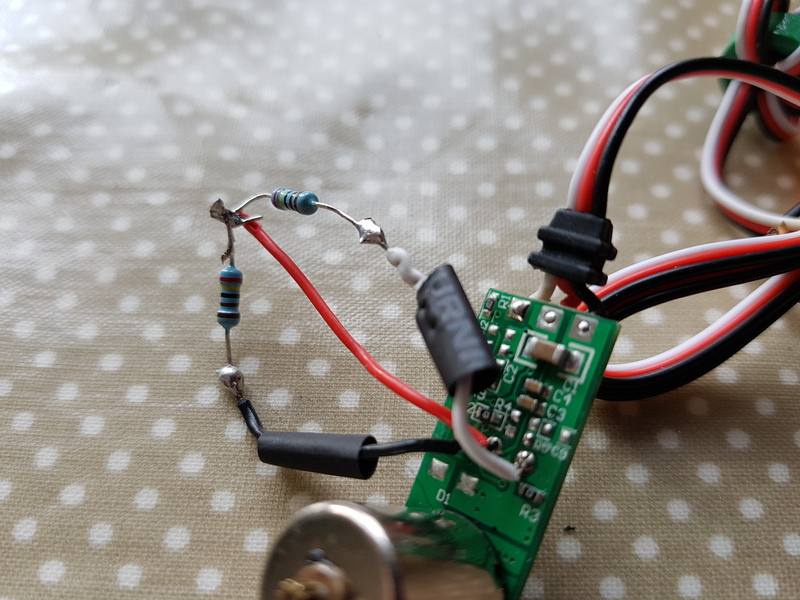 I've done this by putting 2 x 2.2k resistors in place of where a petentiometer should go, so that upon recieving a signal, it never hits a limit telling it to stop, and so will keep turning until the transmitter gives it a new command. I've also removed a stopping pin on one of the drive gears of the servo, so with both of these changes, it essentially functions like a motor/ESC combo. I have however run into a problem. When everything has been bound, the servos default state seems to be to rotate clockwise slowly. After monitoring the signals given by my transmitter, it seems that it stops turning when in the position of -12, but I can only modify my trims to +10 and -10, so even at max trim setting, it keeps turning, albeit slower. My question is if anyone knows if there is any way on the DEVO 7E transmitter to extend the trims to further then what the physical switches allow, and to increase the dead zones on the transmitter so that it's not quite as sensitive in the centre. If anyone has any other suggestions then I would be welcome to hear those as well. I am not sure how to use the transmitter. But you could change one of the resistor values slightly to get it a bit nearer center. I'm wondering exactly how I can change one of the resistor values slightly, I assume you mean to swap one of them out with another resistor? If so, then that may be hard for me as there is nowhere nearby for me to get resistors from. I'm pretty sure the wiring is alright, but I'll re-do it again just to be sure. Another discovery I made by the way was that when I used the OrangeRx receiver from my FW, the central point was at the -12 position on the transmitter, while on an identical receiver I purchased for my BW, it was at -17. For the record, I'm using a Devo 7E with Deviation software if that can help anyone to figure out how to modify dead zones on the transmitter, though it seems that there is variation with the receivers in this case. No idea whats going on with the different trim values with the same/different Rx's, but you could check something with the resistors. Did you measure their actual values before fitting them? Like all components they have a tolerance and although I doubt it, you may have one near the bottom end of the range and one near the top. Measuring them with a multimeter would rule this out, but be sure to un-solder one end of each resistor before measuring it. Long shot, but worth a check.